The 34-story property takes up most of a city block in the southeastern stretch of downtown. Guests can head to the shores of Lady Bird Lake (formerly known as Town Lake) for a jog or paddle-boarding session before hitting the town. Great bars and restaurants surround the hotel, and the State Capitol is less than a mile away. My stay in May got off to a rocky start when a new reception associate put me in a room that turned out to be a bed-free hospitality suite. To the hotel’s credit, the front desk manager apologized, gave me a $25 gift certificate to spend at the hotel’s bars or restaurants, and sent me to a lake-facing room on the 24th floor. 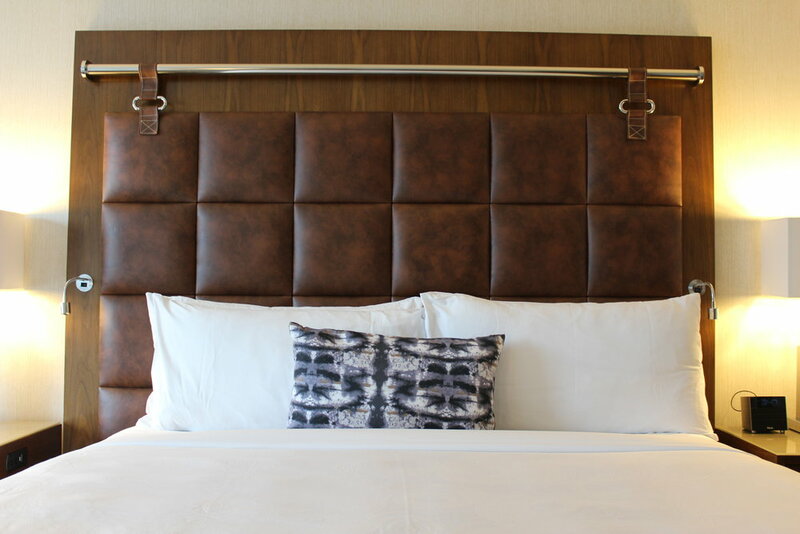 It was spacious, comfortable and outfitted with a healthy dose of Texas accents, including decorative prints dipped in burnt orange and an unusual brown leather quilt draped over the tall wooden headboard. The room also contained a marble-topped desk, a flat-screen TV and an iHome music docking station. I had a view through my room’s glass wall of a pleasant, albeit small, stretch of the lake. Opened with a sliding barn door, the room had a porcelain-tiled shower and floor. The marble countertops, a Kohler sink and products by the London-based Aromatherapy Associates added a touch of luxury. In addition to 24-hour room service, the hotel has three restaurants: Osteria Pronto, an upscale Italian eatery; the more casual Corner, which features Texas cuisine and a large patio; and a walk-up Burger Bar that channels Austin’s grab-and-go food truck culture. When I first visited the hotel, just weeks after its opening, I met friends for drinks in the lobby bar. We sipped pinot noir beside the glass-encased fire that divides the space, but the bar felt less cozy during my overnight stay in May, perhaps because I’d spent the afternoon feeling lost as I explored the behemoth hotel. My friends and I on the most recent visit had a few rounds of 2nd Street Lemonade (an in-house concoction of Tito’s vodka, lemon, ginger liqueur, strawberry and cucumber), $13, and decided to leave the hotel in search of something livelier; only then did we realize that the crowd at the Corner restaurant, which has its own bar, was spilling onto the street. To refuel the following morning, I ordered room service. Though tasty and delivered promptly, my “All American” plate of scrambled eggs, bacon and hash browns seemed pricey at $22. This downtown newcomer also features a spacious, 3,500-square-foot gym with nine treadmills, and an outdoor pool with a deck on the fifth floor. There was actually more room for lounging on the deck than swimming laps. Conference attendees will appreciate the on-site Starbucks and 24-hour business center. While Wi-Fi is free in the lobby, you are charged for it in your room. This hotel will appeal to conference-goers and business travelers, but boutique aficionados should look elsewhere. The JW Marriott, 110 East Second Street; 512-474-4777; marriott.com/hotels/travel/ausjw-jw-marriott-austin.